Poet, dramatist, scholar, and nun, an outstanding writer of the Latin American colonial period and of the Hispanic Baroque. Sor Juana’s enduring importance and literary success are partly attributable to her mastery of the full range of poetic forms and themes of the Spanish Golden Age, and her writings display inventiveness, wit and a wide range of knowledge. Juana employed all of the poetic models of her day, including sonnets and romances, and she drew on wide-ranging—secular and nonsecular—sources. Unlimited by genre, she also wrote dramatic, comedic and scholarly works—especially unusual for a nun and even more unusual for a women in that era. Born to a creole family in 1648, sor Juana was a child prodigy. At the age of fifteen, she amazed people at court by excelling at an oral exam that tested her knowledge of physics, philosophy, theology, and mathematics. She came to live as a lady in waiting in the house of the viceroy (the substitute or representative for the Spanish king in Mexico). Shortly afterwards, she chose to become a nun instead of marry. She entered the Carmelite convent in 1667, but left a year later to join the Jeronymite order in 1669—and in the process gained intellectual freedom. The Jeronymite order allowed her to host intellectual gatherings and live a comfortable life. I do not study in order to write, nor far less in order to teach (which would be boundless arrogance in me), but simply to see whether by studying I may become less ignorant. This is my answer, and these are my feelings. . . . Despite her eloquent defense, the Church forced her to relinquish her literary pursuits and even her library. 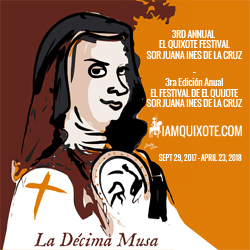 When she sold her library and musical and scientific instruments, she wrote a document that renounced her learning, which ended with “I, Sor Juana Inés de la Cruz, the worst in the world,” signed in her own blood. After giving up her intellectual pursuits, she cared for the infirm during an epidemic but she fell sick and passed away.